An aircraft stall results from a rapid decrease in lift caused by the separation of airflow from the wing’s surface brought on by exceeding the critical AOA. A stall can occur at any pitch attitude or airspeed. Stalls are one of the most misunderstood areas of aerodynamics because pilots often believe an airfoil stops producing lift when it stalls. In a stall, the wing does not totally stop producing lift. Rather, it cannot generate adequate lift to sustain level flight. Since the CL increases with an increase in AOA, at some point the CL peaks and then begins to drop off. This peak is called the CL-MAX. The amount of lift the wing produces drops dramatically after exceeding the CL-MAX or critical AOA, but as stated above, it does not completely stop producing lift. In most straight-wing aircraft, the wing is designed to stall the wing root first. The wing root reaches its critical AOA first making the stall progress outward toward the wingtip. By having the wing root stall first, aileron effectiveness is maintained at the wingtips, maintaining controllability of the aircraft. Various design methods are used to achieve the stalling of the wing root first. In one design, the wing is “twisted” to a higher AOA at the wing root. Installing stall strips on the first 20–25 percent of the wing’s leading edge is another method to introduce a stall prematurely. The wing never completely stops producing lift in a stalled condition. If it did, the aircraft would fall to the Earth. Most training aircraft are designed for the nose of the aircraft to drop during a stall, reducing the AOA and “unstalling” the wing. The nose-down tendency is due to the CL being aft of the CG. The CG range is very important when it comes to stall recovery characteristics. If an aircraft is allowed to be operated outside of the CG range, the pilot may have difficulty recovering from a stall. The most critical CG violation would occur when operating with a CG that exceeds the rear limit. In this situation, a pilot may not be able to generate sufficient force with the elevator to counteract the excess weight aft of the CG. Without the ability to decrease the AOA, the aircraft continues in a stalled condition until it contacts the ground. The stalling speed of a particular aircraft is not a fixed value for all flight situations, but a given aircraft always stalls at the same AOA regardless of airspeed, weight, load factor, or density altitude. Each aircraft has a particular AOA where the airflow separates from the upper surface of the wing and the stall occurs. This critical AOA varies from approximately 16° to 20° depending on the aircraft’s design. But each aircraft has only one specific AOA where the stall occurs. There are three flight situations in which the critical AOA is most frequently exceeded: low speed, high speed, and turning. One way the aircraft can be stalled in straight-and-level flight by flying too slowly. As the airspeed decreases, the AOA must be increased to retain the lift required for maintaining altitude. The lower the airspeed becomes, the more the AOA must be increased. Eventually, an AOA is reached that results in the wing not producing enough lift to support the aircraft, which then starts settling. 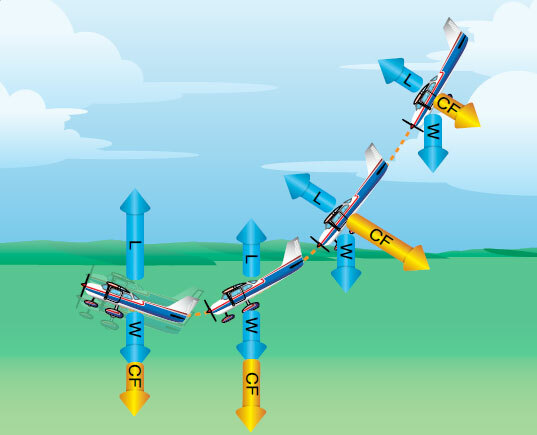 If the airspeed is reduced further, the aircraft stalls because the AOA has exceeded the critical angle and the airflow over the wing is disrupted. Figure 5-38. Forces exerted when pulling out of a dive. Low speed is not necessary to produce a stall. The wing can be brought into an excessive AOA at any speed. For example, an aircraft is in a dive with an airspeed of 100 knots when the pilot pulls back sharply on the elevator control. [Figure 5-38] Gravity and centrifugal force prevent an immediate alteration of the flight path, but the aircraft’s AOA changes abruptly from quite low to very high. Since the flight path of the aircraft in relation to the oncoming air determines the direction of the relative wind, the AOA is suddenly increased, and the aircraft would reach the stalling angle at a speed much greater than the normal stall speed. 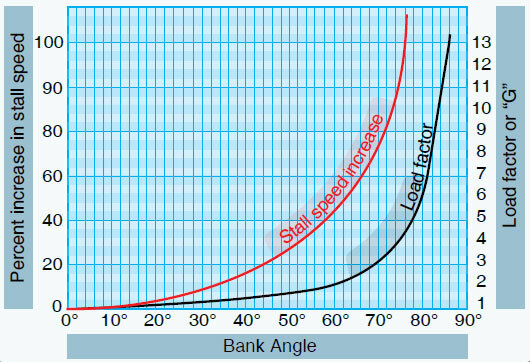 The stalling speed of an aircraft is also higher in a level turn than in straight-and-level flight. [Figure 5-39] Centrifugal force is added to the aircraft’s weight and the wing must produce sufficient additional lift to counterbalance the load imposed by the combination of centrifugal force and weight. In a turn, the necessary additional lift is acquired by applying back pressure to the elevator control. This increases the wing’s AOA and results in increased lift. The AOA must increase as the bank angle increases to counteract the increasing load caused by centrifugal force. If at any time during a turn the AOA becomes excessive, the aircraft stalls. Figure 5-39. Increase in stall speed and load factor. At this point, the action of the aircraft during a stall should be examined. To balance the aircraft aerodynamically, the CL is normally located aft of the CG. Although this makes the aircraft inherently nose-heavy, downwash on the horizontal stabilizer counteracts this condition. At the point of stall, when the upward force of the wing’s lift diminishes below that required for sustained flight and the downward tail force decreases to a point of ineffectiveness, or causes it to have an upward force, an unbalanced condition exists. This causes the aircraft to pitch down abruptly, rotating about its CG. During this nose-down attitude, the AOA decreases and the airspeed again increases. The smooth flow of air over the wing begins again, lift returns, and the aircraft begins to fly again. Considerable altitude may be lost before this cycle is complete. Airfoil shape and degradation of that shape must also be considered in a discussion of stalls. For example, if ice, snow, and frost are allowed to accumulate on the surface of an aircraft, the smooth airflow over the wing is disrupted. This causes the boundary layer to separate at an AOA lower than that of the critical angle. Lift is greatly reduced, altering expected aircraft performance. If ice is allowed to accumulate on the aircraft during flight, the weight of the aircraft is increased while the ability to generate lift is decreased. [Figure 5-40] As little as 0.8 millimeter of ice on the upper wing surface increases drag and reduces aircraft lift by 25 percent. Figure 5-40. Inflight ice formation. Pilots can encounter icing in any season, anywhere in the country, at altitudes of up to 18,000 feet and sometimes higher. Small aircraft, including commuter planes, are most vulnerable because they fly at lower altitudes where ice is more prevalent. They also lack mechanisms common on jet aircraft that prevent ice buildup by heating the front edges of wings. Icing can occur in clouds any time the temperature drops below freezing and super-cooled droplets build up on an aircraft and freeze. (Super-cooled droplets are still liquid even though the temperature is below 32 °Fahrenheit (F), or 0 °Celsius (C).